-Seconds are shown from the start. -Larger display with more information. -Twenty five pre-set timing systems. -Five slots for customized settings. -Five year warranty! The DGT3000 is DGTs most advanced game timer yet. The housing measures 166mm x 114 mm x 65mm. The display size is 130mm x 30mm. The unit weighs 250g. 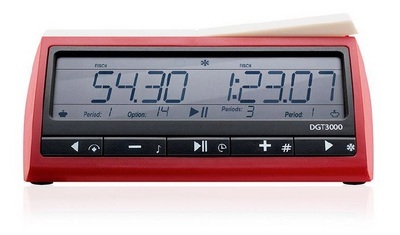 For more detailed functional information, here is the DGT3000 user manual.